In Hollywood 1928-1933 by Renovation at WA Tunes. Hurry! Limited time offer. Offer valid only while supplies last. (2-CD set) Gus Arnheim's 5 year residence at the Coconut Grove marked a period of its highest popularity; his name was synonymous with the Grove. 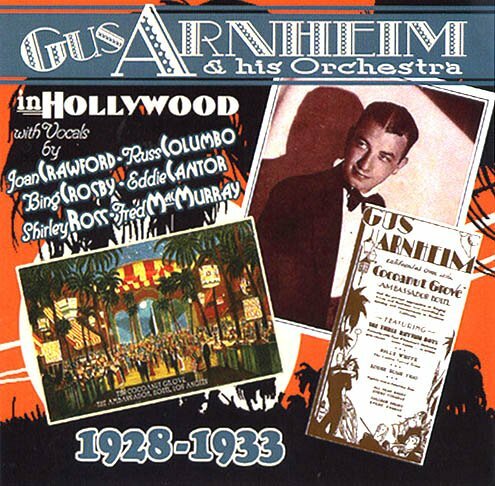 (2-CD set) Gus Arnheim's 5 year residence at the Coconut Grove marked a period of its highest popularity; his name was synonymous with the Grove. What has now become known as the 'West Coast Sound' was particularly apparent in Arnheim's presentation. The driving rhythms and hot solo breaks of the New York band were contrary to a smoother, sweeter, more refined style of playing in L.A. This style had a strong emphasis on the sax and reed sections, with a more held-back melody line. He began recording with OKeh Records (1927-29) but it wasn't until his contract with Victor Records in 1929 that the real Arnheim sound emerged. Heard on this CD are vocals by Joan Crawford, Bing Crosby, Fred MacMurray, Shirley Ross, Russ Columbo and Eddie Cantor. If you have any questions about this product by Renovation, contact us by completing and submitting the form below. If you are looking for a specif part number, please include it with your message.